Usually during the Tour De France my friend Kim and I watch ‘together’. She will be in the lounge of her home in Australia and I will be in the lounge of my home in Gordons Bay. We sit with our laptops, chatting on IM and we discuss where they are, how the riders are doing and generally what has happened during our day. It is so amazing that she can be 6 hours time wise away and about 20 hours of travelling away from me. As soon as she hits the enter button on her laptop, I can read what is on her mind. So, during the tour I have been coming home to chat to her, but she has not been online. It is usually about 17h00 here when I get home, and I know that means it is bed time for her, but I miss her. In order to keep myself company, I will have to cook! This calamari risotto is a perfect meal as it takes time to prepare everything, and there is still 35km to go of today’s tour. I submitted this recipe for Presto Pasta Nights, last week to Debbi Does Dinner but my email seems to have got lost in the ethernet, so I am sending it off to Anu of Truth Personified for this week. I know what it’s like to have a best friend in another time zone… hard to actually connect, but when we do, it’s wonderful. Sorry your dish didn’t make it into last week’s Presto Pasta Night Roundup – and even though risotto is really a rice not a pasta dish – I always think of it as such. I’m drooling at how delicious it looks. Had grilled calamari for lunch today but now wish I´d made a risotto instead 🙁 Should have read my messages earlier! Wow Tandy, this calamari risotto looks delicious, creamy and full of flavor. 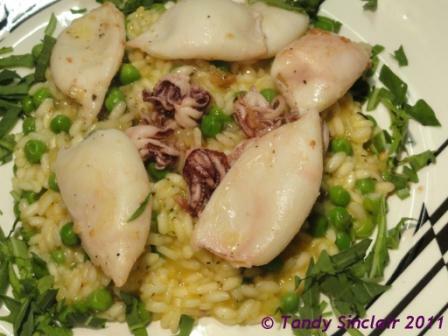 Tandy, your calamari risotto looks fabulous! Think I may have to put in an order for this if I ever come to visit. Tandy, That looks and sounds amazing. I love risotto! I’m sure to try once life settles down a bit. please let me know how it worked out when you do try it! I’m not a calamari fan, but this looks good.